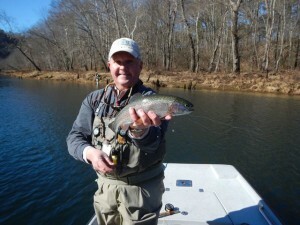 We are enjoying some really wonderful weather and the fly fishing has been terrific! 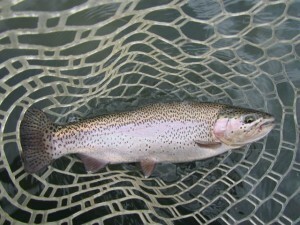 We got on to some really dandy Rainbows this past weekend. It was one of those trips where you catch a few fish and change flys, catch a few fish and change flys, catch a few more and change flys again. The list of flys included: #16 Flash Back Gray Sowbug, #18 Black Zebra Midge, #16 Crispy Creme, #16 Copper John, #12 PT Jig, #16 PBS and #14 RG/PT Cruiser. 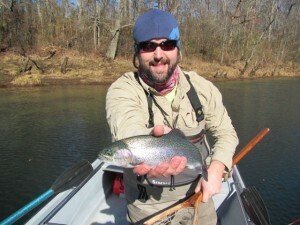 We fished the lower river on Sunday looking for a March Brown hatch but the weather man really missed the forecast and it just did not happen; but as you can see we still caught a bunch of nice fat Rainbows. 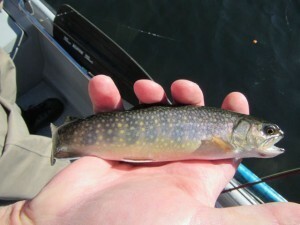 Trent also caught a beautiful little Brookie shown in the lower left corner. We should start seeing some good streamer action very soon as it will not be long before the Brown Trout are rested up and getting hungry after their recent spawning activity. We will be working on the White River this week and attending Streamer Fest at Dally’s Ozark Fly Fisher in Cotter, Arkansas this weekend. When we return we will have a fishing report and photos from the big Streamer Fest party!